Financing infertility treatment is a significant challenge for most prospective parents. Since most of us who are covered by health insurance have that coverage provided through an employer, the first step to financing treatment often begins at work. But only around a quarter of employers offer fertility benefits, according the Society for Human Resource Management. A handful of states — Arkansas, California, Connecticut, Hawaii, Illinois, Louisiana, Maryland, Massachusetts, Montana, New Jersey, New York, Ohio, Rhode Island, Texas and West Virginia — mandate that insurers cover or offer coverage of infertility diagnosis or treatment. 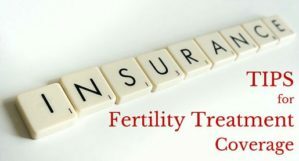 The good news is that even in states where coverage is not mandated, some employers may choose to include fertility treatment coverage in their health insurance benefits package. According to a study by FertilityIQ, the number of companies that offered some level of fertility benefit grew 10 percent in 2017. Employers in the technology, consulting/accounting, and banking/finance industries are the most likely to offer fertility treatment coverage, but even retailers like Dressbarn, Target, Starbucks and JCPenney offer some level coverage. The first stop in finding out if the health plan offered by your employer covers fertility treatment will most likely be the benefits contact within your human resources office. You could also call the customer service number on the back of your insurance card and ask about coverage. You’ll want to ask more than simply whether or not coverage is offered on your plan. If your employer offers the option of several plans, ask which plans, if any, offer the coverage, so you can consider switching during open enrollment. You’ll also want to know details of the plan, such as whether or not there is a waiting period before you can access the benefits, which specific procedures are covered, and coverage or age limits. But just because coverage is offered doesn’t mean your insurance company will pay for everything related to your treatment. If your plan does cover infertility treatment, ask for a copy of the plan in writing, and review it carefully. You’ll want to understand your deductible, what is applied towards the deductible, your co-pay and your networks. You’ll also want to understand whether pre-authorizations for treatments are required, and if so, how that process works. You’ll want to review periodically throughout your treatment, and make sure you understand how everything is covered and what you’ll be responsible for paying. Our financial counselor can guide you through your insurance plan and help you understand what’s offered. Be sure to tap into this valuable resource – you’re not alone in trying to understand your options. But what if your employer doesn’t offer coverage? You could always ask them to consider adding fertility coverage to one or more of the health plans offered. The argument for offering fertility coverage is actually quite strong. Infertility is actually a common issue that affects one in eight couples of childbearing age. That’s similar to the percentage of the workforce that has type 2 diabetes, estimated at 6.3 percent. Given the prevalence of infertility, it makes sense that employers would consider offering support for workers facing it. Offering coverage for infertility treatment, including IVF, hasn’t been found to increase insurance premiums in the vast majority of cases for group plans. In fact, including infertility treatment in plans may actually lower costs overall as it allows patients to shape their treatment based on medical needs rather than on what they can pay for. If a plan allows for several IVF cycles, for instance, a patient may not feel pressured to use as many embryos in a single cycle, which lowers the risk of more complicated and potentially costly higher-order births. Resolve has a number of resources that will help guide your conversations with your employer seeking coverage for infertility treatment. Resources include a section for employers, and a section for employees which includes a sample letter. As with everything on your journey toward parenthood, being an informed, empowered advocate is key. Need guidance? We are here to help.